This review first ran in the Feb. 17 edition of The Hamilton Spectator. So who’s the Eeyore in your group? Like the donkey from Winnie the Pooh, who’s your pessimistic and perpetually anxious teammate? Who in your group can be counted on to play the devil’s advocate? Who has the courage to zig while the rest of us zag? Who has zero interest in going along to get along? And who will always put the good of the organization ahead of self-interest, even if it means finishing dead last in the office popularity contest? Every smart group has an Eeyore. A group of really smart people lacking an Eeyore will make some really dumb decisions. A devil’s advocate is one of the ways to hedge against a host of pitfalls and biases that send groups sailing off in wrong directions. Research shows that two heads aren’t always better than one, say authors Cass Sunstein and Reid Hastie. Sustein is a U.S. legal scholar who served as administrator of the While House Office of Information and Regulatory Affairs while Hastie is an expert on the psychology of decision making. Here are just a few of the reasons behind all the garbage coming out of groups. We tend to follow the alpha dog, even when we don’t agree. Staying silent is rarely a career limiting move. Groups tend to be overly optimistic. We become far more confident in our judgments when we’re in a group of like-minded individuals. Groups like to focus on what everyone already knows rather than soliciting unshared information that may challenge the gospel truth. “When most of the unshared information is opposed to the position that is initially the most popular, that unshared information will never be discussed and shared information will dominate,” warn Sunstein and Hastie. And while we may join with moderate views and an open mind, our group will inevitably drift to a more extreme and entrenched position. You can watch polarization happen with online groups, where anyone with a dissenting view is dismissed as misinformed, easily misled or a manipulative troll. “Group polarization is more likely and is heightened when people have a sense of shared identity and belong to a tight-knit group or club,” say Sunstein and Hastie. So how do you build a wiser group that makes smarter decisions? If you’re the leader, speak last. Show some love to your devil’s advocate. Insist that members disclose information and inconvenient truths that the rest of the group doesn’t know yet. And reward individuals for contributing to correct group decisions. 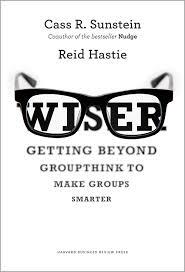 Whether you’re in the private, public or nonprofit sector, Sunstein and Hastie show how to build smarter and wiser groups. If no one around the table is asking what’s the worst thing that could happen, your organization’s destined to find out. This review first ran in the Feb. 2 edition of The Hamilton Spectator. Scrapping the downtown bus lane was disappointing. The blowback on social media was disconcerting. A local nonprofit decided to auction off Councillors without their consent. There were calls to “make life miserable for these jokers for the next four years” and confessions that “I have no intention to be even polite anymore.” A few Hamiltonians even mused about pulling up stakes and moving to more transit-friendly cities. It’s been just shy of two months since Hamilton’s newest edition of Council was sworn in. We’re looking at a long and unproductive four years unless we learn how to change the conversation in our community. We’re not going to build a better transit system for all if we careen down the low road. Resist the urge to attack. Change the conversation from the inside. Acknowledge emotions. See them as signals. Test your assumptions. Relinquish them if they prove to be false. Assume undiscovered options exist. Seek solutions people willingly support. Be explicit about agreements. Be explicit when they change. Expect and plan for future conflict. Before we face the next Most Important Decision To Ever Be Made in the History of Hamilton, we’d do well to read Changing the Conversation. While it delivers instant validation and adulation, ramping up the rhetoric on social media won’t get us where we need to go. 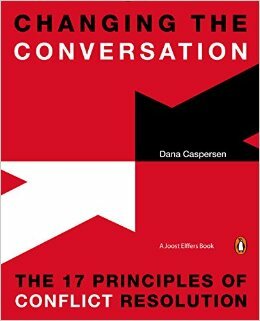 Caspersen’s 17 conflict resolution principles just might pull us out of the never-ending loop of attack and counterattack. Maybe we can even crowdfund to have Caspersen stage an intervention that gets us all on the bus. @jayrobb lives and works in Hamilton.